Field Artillery leaders; design and develop fire support for the force; support unit training and readiness; mobilize and deploy operating forces, and maintain installation infrastructure and services. The primary mission of artillery units is to support infantry and tank units in combat by providing effective fire support on enemy troops and vehicles. Fort Sill in Oklahoma houses the Field Artillery School, the primary training facility for field artillery soldiers and Marines worldwide. In the Army, this is career field 13. This soldier loads and fires howitzers, sets fuse and charge on a variety of munitions, including high explosive artillery rounds, laser-guided projectiles, mines, and rocket assisted projectiles. To qualify for this job, you'll need to score at least a 93 on the field artillery (FA) aptitude area of the Armed Services Vocational Aptitude Battery (ASVAB) tests. These soldiers operate Advanced Field Artillery Tactical Data Systems for both cannon and multiple launch rocket systems (MLRS). The 13D Specialists play a critical role in the safe, accurate, and lethal delivery of both cannon and MLRS systems on enemy targets. You'll need a score of 93 on the FA area of the ASVAB, and have to be eligible to qualify for a secret security clearance if you're planning to pursue this MOS. Fire support specialists help the Army determine where and how to deploy artillery in combat situations. You'll need a secret security clearance and a 93 in the FA area of the ASVAB. It is a high-pressure combat job that requires soldiers who can make decisions while potentially under enemy fire. The MLRS launches various missiles and ammunition in quick strikes during combat. These soldiers detect enemy forces and alert Army units. They're trained to use highly sensitive radar called Firefinder, and other detection equipment, often in the heat of combat. This role is critical to successful combat missions and like all the MOS in the artillery field requires soldiers who can work well under pressure. You'll need a score of at least 98 on the surveillance and communications (SC) segment of the ASVAB, and will spend ten weeks in AIT training at Fort Sill after completing boot camp. Part soldier, part meteorologist, this job monitors weather conditions for the field artillery team's combat missions to ensure accurate missile launches. They learn how to analyze weather systems, launch weather balloons and prepare schematic sketches. To qualify for this MOS, you need at least a 93 on the electronics (EL) segment of the ASVAB. After boot camp, you'll spend ten weeks in AIT at Fort Sill. Field artillery senior sergeant leads in the fire support, operations/intelligence, and target acquisition activities in a field artillery battalion, brigade, division artillery, or corps artillery. It is not an entry-level position and requires a secret security clearance from the Department of Defense. As you can see being a Field Artillery Specialist is more than "dropping lead from above," which is an outdated description. 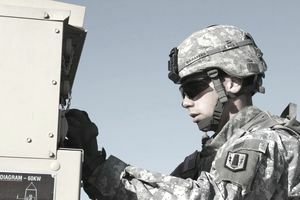 The 21st-century artillery team member is highly skilled, whether it's in communications, computer systems, meteorology or nd target recognition.